It’s been a mere 2+ years but it seems like I’ve been blogging for ever. Blogging has taken over my life in such a way that I now look at my life in 2 categories; Life before My Blog and Life after My Blog. *And my subconscious produces an image of my better-half looking at me incredulously* well ok I’m kidding but you know what I mean, right!!!! Blogging has resulted in Improved Writing: Initially I started out writing for myself and so didn’t bother too much about legibility, syntaxes or continuity. But gradually the fact that many people were reading my posts started to dawn and that did make a difference to my writing. I became more careful about how I presented my subject and tried hard to bring clarity in my thoughts which I feel has resulted in improved writing; I can’t say for sure though, the only person who can tell me that is YOU. Blogging made me more focused: I used to be somebody who had problems concentrating on a task to the finish but blogging is something I have not tired of even after 2 years. I pride myself on the fact that I complete what I start…..all my posts have concluding paragraphs don’t they???? Infact I never realized how much patience I had until I clicked NO on the word document I wrote on Global Village & watched the whole post disappear into nothing. I put my head down and wept. Unlike most posts which come out of my head, I had gone thru a hundred links for this one. I sat down the next day again, hunted out all those links and wrote the whole post painstakingly from scratch. I don’t ever remember putting in this much effort even for school exams. Blogging helped me accept compliments more gracefully: I can’t pinpoint exactly what it is but compliments make me uncomfortable. Say for eg, somebody complimented me on a particular dish I made I would go all flustered and immediately explain that the vegetables were really fresh, how the masala was handground and brought all the way from Kerala and thats why it was so good. The better-half would time and again tell me there was no need to go into long-winded explanations and just accept the compliments at face value. When I started getting compliments for the posts I wrote, for a long time I never really believed them. I would scrutinize the post and shake my head in wonder; they made me feel happy ofcourse but I thought all of U were being kind. Gradually the realization dawned that people would not keep coming back again and again if they didn’t like they were reading. Now I have begun to accept them gracefully both here and in life. Blogging helps me with my children: I never interacted with small children in my teenage years; infact I remember deliberately keeping my distance from them. When I had 2 kids of my own I’m not going to say I was awful at child rearing but reading many mama blogs gave me innovative ideas how to keep them occupied, make interesting snacks they’d like to eat and helped me reach them at their wavelength. Inshort blogging about my children, their perspectives and inturn receiving valuable input & compliments from ALL of you boosted my knowledge and confidence. Blogs keep me updated: There are days when I don’t watch the news on tv or read newspapers. But reading blogs really help me keep up with both technology and current affairs. And the links provided at these places give me all the information which I’m sure I would not get in any newspaper. People & accomplishments: Reading about ordinary people & their extraordinary achievements always leave me inspired. There is something about reading it in blogs….sort of makes it more real than reading what is written rather dryly in the papers. Blogging is restorative: Honestly in many ways it’s been rather therapeutic for me. Blogging about people, places and Pluto myself really helped me express myself & in some vague yet definite way I’ve learned to appreciate the few redeeming qualities I have. Now if I weren’t blogging imagine how much I would have had to shell out for a psychologist to arrive at the same conclusion;-D.
Now you tell me, how has blogging proved beneficial for you????? shhaahh..missed again !! grrr Swaram ! Oh yes Nu, agree with u there....my outlook on a whole lot of issues has changed, become broader in many ways. Happy Woman's Day to U too:-))!!!!!! The fact that you can at this point in time sit and jot down the ways blogging has helped/changed you in itself is a huge thing.. What I like is that simplicity in your writing is intact over the period..
coming to the question at the end, I am not sure.. i dont think i have reached the stage where i can say blogging has changed me in a way.. I am not good at articulating what i have to say but at some blogs i feel "yes, thats exactly my point." many a times, it gives me an assurance that i am not the only one who thinks or does things in a particular way.. I enjoy the reading aspect of blogging more than writing..
Hey Nan ... As much as blogging helped you, your blogs are a whiff of fresh air for me. The way you write - funny and witty is just adorable. I am especially fond of the way you recount funny situations with your kids! :-) And when you write moving posts, it genuinely sounds like you care. Like the one about Chaitra. Thanks for writing and may you derive more happiness than you thought possible from being your blog's mouthpiece! Hugs for you! Yes. It has helped me too.. even though I am a careless and a lazy blogger and vanish from blogosphere for months on end, i would definitely say it was a good decision to start a blog.. I have got to know some really amazing people., and I am not just saying that. There are a couple of people who I feel like I have known them forever and look forwrad to meeting someday.. You being one! You, my friend, are one of my favorite bloggers- there are those who blog who make it seem as though it is a chore- or those who blog who make it seem like they have no idea what they are talking about...but you - when you blog- I can tell you have put thought into your posts- AND you care- AND you ALWAYS leave me great food for thought. a good way to release stress for me :D I love writing things out and getting it out of my system. Nice people to interact with in the virtual world. Improved writing, like you have mentioned. If I had read this blog post without knowing who wrote it, my first guess would have been you Nancy! You have a way of elegantly expressing the simplest of thoughts, and resonating with what most bloggers think and feel. I can relate to every one of your reasons, except the mommy part becasuse I am not one yet, but I sure love reading all the mommy bloggers, because I do learn a lot from their experiences. Loved the picture. The quote puts the gist of blogging wonderfully. Totally and completely true N. I blog for the same reasons too. There's another reason why we love your blog. Yes, of course you write well, yes of course we like what you write. But equally, through the blog, we've come to know a fine person. We love your blog, because behind it, we love who you are. This is a post I can so so so relate to. There are so so many of these things that I have found happening with me too, since I started blogging. Being able to receive compliments well, my writing abilities have improved drastically, it has become more coherent, I have become more focused too, and writing about certain things helps me clear my mind about it, understand it better, and bonding with other mommies, has been such a boon, that I cannot even begin to say it. Loved reading this post, almost felt like I am reading about my own rite of passage. A lovely post from Nancy, yet again. Nancy(Natraj) ek baar phir champion. Great points Nancy. I have been blogging for only about 6 months now, I find that it has already broadened my horizon. You are one of my most favorite bloggers. I think there's no need to add anything more....you've summarised it all very beautifully!! you are absolutely right Nancy.. Each point is perfect. It has helped me a lot especially in just pouring down my heart whether it is joy or sorrow. Also, my english has improved a lot..
nance, i'll be back to read all but just wanted say that this is a very unique post. good job! Mindspace: "I am not good at articulating what i have to say but at some blogs i feel "yes, thats exactly my point......way""
ISH: I may use ur comment section to call u names but believe me when I say I dont blame u 1 bit:-)....U r a lazy blogger simply because LIFE is more interesting. Anjuli: Dont make me laugh...u memory is as sharp as ever, I'm always amazed at the variety of infomation u give us in ur posts. And Thank U...ur comments always lift my spirits and mean a lot to me:-). Sulo badri: If u look back at my earlier posts there are hardly any comments and the followers button was introduced just a year or so back; what I'm trying to tell u is enjoy what u do and interact with others who share ur interest. Keep on at it....a few years later when u look back u'll realise it was all worth it:-)). Jira: Dear girl, where have u been??? I have been loitering OUTSIDE ur blog with an award for quite sometime now;-/. LET ME IN!!!! And thank U for the lovely comment:-)!!!! Ramesh: Awwww, AWWWWW...u say the marvellous things:-D!!!! Smita: "my thoughts which remained just thoughts have been expressed.."
Wanderlust: Thank U...Love u too:-D!!!! very thoughtful :) ..almost tending to a exhaustive list of how blogging could be helpful to a being.. except one found all of them fitting into my reasons..
Firstly, congrats on your Century! You have a hundred followers! You write really well and like me, I am sure that there are many bloggers, who are waiting for a post from u.
Sriram: Agree with U and thank U:-))!!! Kavya: "It has helped me a lot especially in just pouring down my heart whether it is joy or sorrow. Girl, u got the essence of blogging down pat:-))!!! lan: Thanks, will wait for ur thoughtful comment:-))!!! Deep: The one which didnt fit must be the children bit, right;-D.
Problem accepting compliments? Learn from me then... I always think I'm the best :P so compliments are just like sunshine in Dubai :)) he he... Ok now stop rotfl, i was just trying to be funny. I think blogging has made me very very confused. Earlier I used to have firm thoughts and ideas which I could defend for the rest of my life in a debate... With blogging, and seeing so many different opinions put across in such convincing fashion, I now wonder whether any argument can be absolutely convincing anymore. Reading blogs has made me change a lot of my own opinions and mindsets actually and I'm become very flexible. Though I'm not sure whether that is a good thing coz. now my wife wins all the arguments. Any person should like what they do or it becomes a job. I can relate to every word u wrote here Nancy..
Hm hm.. that's quiet interessting but honestly i have a hard time determining it... wonder what others have to say..
Rakesh: "I now wonder whether any argument can be absolutely convincing anymore. Oh I dont thinks its as tough as u r making it. Taking an eg of Shiv Sena, if somebody wrote a long post eulogising their activities..r u going to fall for it???? Ofcourse not...but yes it gives u info that they support many villages or are kind to the beggars of Mumbai;-P but tht doesnt mean u r going to start supporting them right. "Reading blogs has made me change a lot of my own opinions and mindsets actually and I'm become very flexible." Abraham: Totally agree:-)!!! Thanks for visiting!!!! Mystery: So glad u liked it:-)!!! Piper: I sooo know what u mean!!!! Hugging u back!!!! Snow: Then I'm so glad u dont have anything to blog....coz it means u r busy with LIFE!!!! Anon: U r vague arent u??? Even after 45 comments u r still wondering what others have to say;-o!!!! Loved this!!!! For it so described my feelings:-). And thank U;-D!!!! Yes, I've become a person with a different perspective to life, after blogging. So many posts have been an eye-opener to me !!! Sometimes, I count myself blessed, while there are so many out there suffering in some way or other !!! And I love your blogs !!! Now, did you accept this at face value ???? And a belated Happy Women's Day to you !!! che! 'spotlight' in the second line would have been better, nah? Nancy: you are so right and I can so relate to lot of what you said. For me blogging was a channel to get out and get to know different people and express what was going on in my mind and heart. As always, loved your writing and expressions. Nice to know that blogging has helped you so much...I am not so sure myself...It has helped me in writing ofcourse and getting new friends and also in keeping me aware of some happenings..
well, that is quite a lot already...right! blogging has indeed changed the viewpoints and perceptions and the quality to an unimaginable extent. i previously never had the faintest idea about the sheer writing quality around. and i feel so proud to read quality posts and works of so many people who might never even get published. What a great post Nancy. I agree, blogging is therapeutic. Umsreflections: Without a doubt I accept ur comments at face-value, ur affection shines thru clearly:-)). Thank U!!!! Suma: Trying to improve on perfection huh!!! Even tho this sounds better the meaning came thru just as clearly in the previous;-D.
Winnie: More than a year surely...I feel I've known u for ever;-). Dil se: Totally agree with ur points. And thank U:-))!!!! Limenlemons: Awwwwww...u disapppear for ages and then come back to say the sweetest things;-D. Thank U!!!!! JoHn: And there are so many people who wd have never in their wildest dreams thought of writing as a career until they blogged and realised they were good with words. Marvellous isnt it!!!! Agnes: Thank U, THANK U!!!! I too am so glad I took to blogging;-)!!!! I know I am always among the first ones to read & the last to comment. That's because I love to read more than I like to write. Also, if I don't have anything to say, I won't. This is a GREAT post. 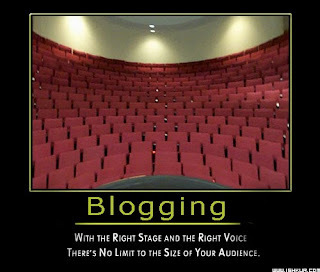 Blogging is definitely beneficial to writers & readers, that's why we are all here. I like visiting your blog again & again because I see it as a socialising event - I read everybody's comments & have met many like-minded people this way. Thank U Nilu for the LOVELY comment:-))!!!! "I like visiting your blog again & again because I see it as a socialising event - I read everybody's comments & have met many like-minded people this way." Really!!! Then u MUST visit Swaram's blog...its a regular adda over there;-D.
hmmmm...close to 2years since i started blogging...though have mustered just 26 posts till date...n not a single thing has changed in my life coz of that! well thinking about it...one thing has changed...apparently they have found water on moon...though i won't say its entirely coz of my blog, but i'm sure it had some role 2 play! Saw the award just yesterday..thank you!! I was away for a lot of reasons..
as for me, blogging gives a sort of satisfaction of creating something special...importantly.. I am not sure about the other things, but blogging definitely helps in molding the writer into a much different, but better person. Perhaps because, as we move along, we meet more and more people and break our shell of being comfortable only if we are in a familiar gathering. It helps a lot..really. nance i am back. for lack of better words, very well thought out article. i find it hard to believe that blogging improved your writing. you have an innate talent to write in a simple and engaging style. for some reason 'stepping stones' is a title of yours i remember very well. being a newspaper columnist will embarrass you or elevate you i am not sure but that is a jig you can carry off effortlessly while working at home. as for me, blogs keep me updated. more importantly they let me get acquainted with people across the world that i can identify with on different levels. this is difficult to realize in real life where you pretty much move around the same circles. now if only i can get rid off this reluctance to leave a comment (a part of me) when i like something.... maybe i am afraid what i am capable of once i lose it. look at your comments section. don't i just fill it up:-) jokes aside, a wonderfully introspective post nance. well done! A good post... world before blogging... ideas transmitted only through our limited interactions, readings, media....after blogging.. limitation is time - no limit on perspectives on the same issue..some black, some white and many in between. Helps me become 'whole'. Agree with all the points that you have listed out. Swathy: Good to see u back;-)!!! The CC House: I totally get what u mean..both the 1st and 2nd point. Swaram: And not to mention the numerous friends we make whom we wd have never otherwise gotten to interact with;-). Lan: I always look forward to receiving ur comments coz u always give me something to ponder over & more reveal a facet of me which I may have never given thought to earlier. "if only i can get rid off this reluctance to leave a comment (a part of me) when i like something.... maybe i am afraid what i am capable of once i lose it." I sooo get what u mean but believe me when I say once u consciously make the decision to, the words just flow and then when u look back later u'll wonder what the fuss was all about:-D.
JP Joshi: "no limit on perspectives on the same issue..some black, some white and many in between. Helps me become 'whole'. Oh yessss....agree with u. The media gives us very controlled info. We bloggers are an enlightened lot huh;-D"
And agree with u about the clarity in the thinking when put onto paper tho in this case into a post;-D.
Excellent write up.Almost 5 months into blogging and i could not agree more. I just love your blog!I have been reading your blog for a few days now...and i realise we have quite a few things in common. I am from bangalore too and recently got married and my mister works in kuwait and i will be relocating soon too. Love to hear your thoughts on how you coped when you first relocated. Ambulisamma: Welcome to my space:-)!!!! And thank U!!!! Lily: Hehe I cd see thru my counter tht somebody was reading all my posts from the beginning;-D. Glad U commented!!!! @relocation - at first it was quite tough to adjust but nowdays with the internet & networking one doesnt feel that lonely anymore...plus if u plan to work then u'll get used to the routine sooner:-). My best wishes Lily:-))!!!!! Thanks for following my blog, Lessons from the Monk I Married. Blogging has changed my life, too. I used to keep all my writing locked away in closets. Blogging made me realize I had something to say in this world and I also have a story to tell. Through my blog and certain other connections, I was able to get an agent in New York City to represent my book, Lessons from the Monk I Married. I blog every single day, but my blog and book are a bit different. I am blogging 365 inspirational lessons! Katherine Jenkins: U have a lovely blog. I'm so glad I found it!!! Wishing U all the best for ur book!!! And welcome to my space:-)!!!! hey. nice to be here after a long time. I guess the last series I remember were your marriage posts. I'm glad u found it useful Captain....it's an old post and I too got an opportunity to refresh my memory. Thanks for taking the trouble to pen a comment:-)). The pleasure is all mine:-).